Check out the new site and follow us on Facebook! Do you remember what were you doing the night of January 26, 1999? Were you lucky enough to be seated in the overfull chambers of the Louisville Board of Aldermen as they took their historic vote on the Fairness Ordinance? Perhaps you were outside, in the sea of supporters, anxiously awaiting word on what was happening inside? Did you join the jubilant crowd at the Connection for the victory rally? Kentucky’s first anti-discrimination Fairness Ordinance passed into law 20 years ago next month, and it ushered in a new era of LGBTQ rights across our state. In July of the same year, Lexington activists’ hard work paid off with their city’s Fairness Ordinance, and Jefferson County later adopted its own in October. Now, ten cities across our Commonwealth extend the same LGBTQ protections that Louisville and Lexington did in 1999. This month, Somerset had its first reading of a Fairness Ordinance that could make it the 11th Kentucky city to ban LGBTQ discrimination in employment, housing, and public accommodations. With your help, we’ll be there every step of the way as new cities seek to advance LGBTQ civil rights, and we’ll work to stop all efforts to thwart or repeal them. 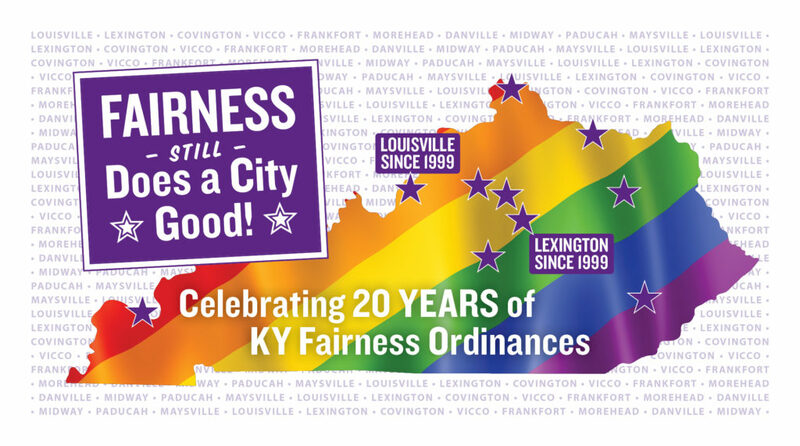 Will you help celebrate this 20-year milestone with a gift of $2,000, $200, $20 monthly, or any amount significant to you to support the continued work of the Fairness Campaign across Kentucky? Thank you for making our work possible and advancing LGBTQ rights all across our Commonwealth. Because of you, Fairness still does a city—and a state—good! SAVE THE DATE: Join our Statewide Fairness Rally and Lobby Day in Frankfort Tuesday, February 26! Click here for more info! Join our mailing list to keep up with the latest from the Fairness Campaign. 3rd Monday Monthly, 5:30 p.m. ET: Frankfort PFLAG, Unitarian Universalist Community of Frankfort, 314 Wilkinson St.
3rd Monday Monthly, 6:30 p.m. ET: Frankfort Fairness, Unitarian Universalist Community of Frankfort, 314 Wilkinson St.
3rd Thursday Monthly, 6 p.m. ET: Shelbyville Fairness, Stratton Center, 215 E. Washington St.